The 3x25 Rigoletto Opera Glasses from LaScala Optics blend style and easy handing in a compact optic that brings you closer to the action on stage without leaving your seat. 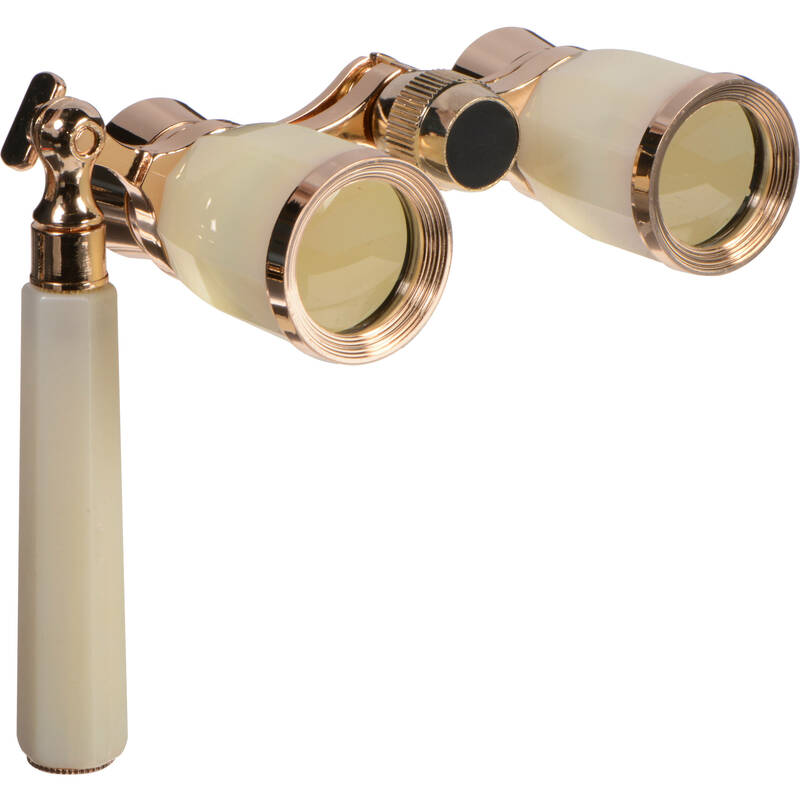 These Mother-of-Pearl glasses feature the classic Lorgnette folding handle design, allowing the Rigoletto to be reduced to a pocket-sized 4.3 x 2.3" footprint for when you're traveling to and from the theater. At show time, just extend the handle to comfortably hold them to your eyes. The center focusing wheel is easily accessible so you'll always have a crisp and clean view of the performance. Interpupillary Adjustment 5.6 to 7.1 cm / 2.2 to 2.8"
Box Dimensions (LxWxH) 5.65 x 3.25 x 2.1"
3x25 Rigoletto Opera Glasses (Mother-of-Pearl) is rated 3.7 out of 5 by 3. Rated 1 out of 5 by Deborah from Looks better online The picture online us deceiving. The mother of pearl just looks like creme and cheap plastic. It does not look classy or elegant at all. Really disappointed with the look of it. Rated 5 out of 5 by Grape Kelly from A great gift I got the binoculars as gifts for two of my friends and they were thrilled! Easy to carry around, the magnification is enough for a theater and they look very elegant. Rated 5 out of 5 by Rajender from Perfect for theater. This is exactly what I was looking for the theater shows we go. Not to big fits in a purse.